I love to decorate my house for all occasions. When I originally thought of our entry way I wanted to keep the decor simple because I knew I would be constantly changing it. It's the first thing our guests see when they walk in our house and I like to give it an update with each season or holiday. Around Memorial Day I take down our spring decor and replace it with our summer decor. 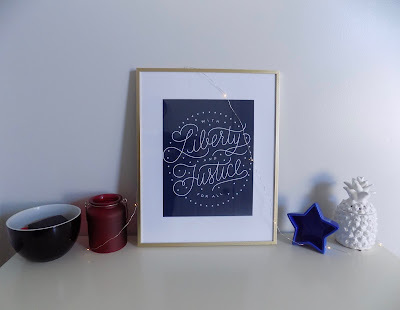 We have a large gold frame that I like to add different festive prints to. 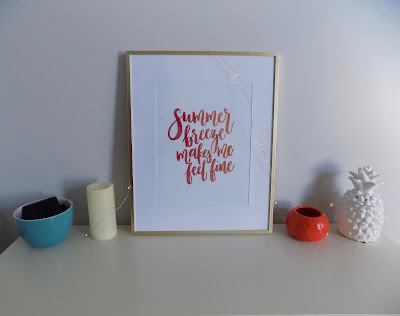 For summer I added a print with a line from the song Summer Breeze that I found on Pinterest. I loved the warm colors the print brought in and it just happened to match a small jar I had laying around. I switched out our normal Scentsy warmer for the white pineapple warmer I got for my birthday. Nothing says summer like fruit! On the other side of the frame I switched out are dark blue key bowl for a turquoise bowl. I felt it contrasted well with our warm colors and was the perfect blue for summer. Next to the bowl I placed a tall cream candle to add in a neutral color and some height. For a finishing touch I draped fairy lights over and around the decor. This is the decor I had up for June and will probably resort to for August. As for July we needed something a little more patriotic. Around Flag Day I like to update the decor in our house for the Fourth of July. I am a big fan of the Fourth of July and it truly feels like summer when red, white and blue come out to play. I added a new bold print to our gold frame. This one has a blue background and reads "For Liberty and Justice For All." I love the color it added in. To the right I kept our pineapple Scentsy warmer since it fit in with our red, white and blue color scheme. Next to it I placed a blue star. On the left side of our frame I added our dark blue key bowl back in and placed a red candle votive next to it. I draped the fairy lights around and over the decor to finish. I try to keep the decor very simple to make it easier and to motivate myself to update it. I find a quote I like on Pinterest to add to the frame, on either side I will place a short and tall object that matches the color scheme or theme and finish off with fairy lights. Do you constantly change your decor?